The first post in the series of Complex Field Types. In this post, I will explain to you the “List Types”. The List types fields are used when a user needs to select one or more values from a list of available options. For example- A Multilist field allows the editors to choose multiple values from a list of available values, A Droplits allows the editors to choose a value from a list of available values. Checklist: Checklist type allows editors to select more than one values from a list of available checklist values. Checklist stores values in as a pipe-separated list of IDs. The checklist doesn’t allow editors to order their selections. Checklist type field cannot be rendered so a developer has to read the selected values and display them on the page. Droplist: A Droplist stores the name of the items. It allows the editors to select one value from the dropdown list. Droplist is similar to Droplink, the only difference is – Droplist stores item name while the Droplink stores the ID of the item. Grouped Droplist: Grouped Droplist field type allows editors to select a single grandchild of the Item specified in the source of the field. This type cannot be rendered. It stores the value as a string (the name of the selected Item is the value). Grouped Droplink: Grouped Droplink field type allows editors to select a single grandchild of the item specified in the source of the field. It’s similar as Grouped Droplist, the only difference is – this field stores the Item ID while Grouped Droplist stores the name of the Item. This field type cannot be rendered. Multilist: Multilist field type allows editors to select the one or multiple values from the available values coming from the specified source of the field. It stores the IDs of the selected items. You can order the selected values. Multilist type cannot be rendered, so to display the selected values, a developer has to read the values using code. Multilist with Search: Similar to Multilist type, this field type allows editors to search the values. The selected values displayed with their path with parent item (Countries – India). Also, you get some other option there like Next, previous, Refresh etc. Other features remain the same as Multilist. This field cannot be rendered. Name Value List: Name Value List type allows editors to store the value in the key-value pair. It inserts a new row when you enter the value in the first row. Also, it does not support any special character in the key field while in value you can use them. The values are stored separated by “&”. This field cannot be rendered. Name Lookup Value List: This field type is an extended version of Name Value List type having many of the similar features. The only difference here is – Name Lookup Value List uses a Dropdown list to choose the value against a key. The editor is still required to type the key name, the dropdown is only for Value field. This field cannot be rendered. Treelist: Treelist accommodate the selected items from the source provided in Field’s source property. 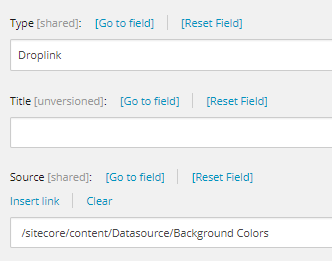 If no source is provided, it will list the whole Sitecore tree and user editors will be able to select any item from there. Treelist stores the values in pipe-separated IDs. This field type cannot be rendered. TreelistEx: TreelistEx is very much similar to Treelist, except that for this field type, the selection option will be opened as a pop-up window. This field type cannot be rendered. TreelistEx is far better than Treelist when performance is the concern. Above explained field types are List Types and in my next post to this series, I’ll come up with the Link Types. So stay tuned here for more on Field types.